Del (Peter Dinklage) is pretty sure he’s the last man on Earth. When we meet him there has been an unspecified catastrophe, in which it seems everyone simply collapsed and died. Del, alone, works his way around his nameless town, going house to house, cleaning up and burying the bodies he finds. One day he sees fireworks going off outside the library he used to work at and now makes his home in. This leads him to meet Grace (Elle Fanning), who quickly latches on to him. Slowly, Del grows to trust Grace and allow her to help him clear the houses. The cinema has shown us many apocalypses. The world has been annihilated by nuclear weapons, killed off by disease, eaten by various forms of undead and drowned by global warming. We never know what has happened in I Think We’re Alone Now (Grace speculates for a moment about the rapture, but the film leaves issues of religion well alone), ultimately it isn’t important. What matters is the fact Del and Grace have been drawn together, not how. The apocalypse in I Think We’re Alone Now is an eerily hushed one. For the first eleven minutes, the film unfolds in silence, as Del goes about his routine; clearing a house, then marking an X to show that property is done. It’s appropriate that the first sign we get of another presence is fireworks, because Grace is an explosion of energy and light which, like the fireworks, Del initially tries to shut out. Dinklage and Fanning are well cast as two people thrown together for no other reason than that they believe there is no one else left. Their slow reaching of an understanding is nicely drawn by writer Mike Makowsky and by the actors. One important moment has Grace asking Del if he’s going to say any words for the person they are burying, he asks if she did that for every body she found. Instead they do what Grace says she did whenever she found someone; holding her breath for ten seconds. It’s grudging from Del’s side, but it’s the first time they really connect. Other little moments work to shore up this connection, like when Grace drops a box of cereal while they are ‘shopping’ and Del, half annoyed, half amused, tells her to pick it up. The two actors are well matched, both performers who like to find detail in their characters, they play off each other with a chemistry that emphasises their connection without ever being creepy. With a low budget to work around, director and cinematographer Reed Morano still manages to make us believe in her deserted world. The town has a chilling emptiness that seems to have been the status quo for months, but which again doesn’t give us much clue to what happened. There is a sense in the design of a place where time just suddenly stopped for everyone and everything aside from Del and Grace (land animals are a sight as rare as other people). It’s only when the film expands that we start to feel the budget bite a little as only one shot really gives us a sense of any scale. While her images are strong – the fireworks sequence stands out, as do repeated shots following Del dragging the latest body to its resting place – Morano tends to foreground her actors, letting their faces tell as much of the story as her images of a world that is at once tiny and impossibly huge. I Think We’re Alone Now isn’t wildly original, and some aspects of it (which I won’t go into here) feel rushed after the first hour has patiently built up the relationship between Del and Grace. 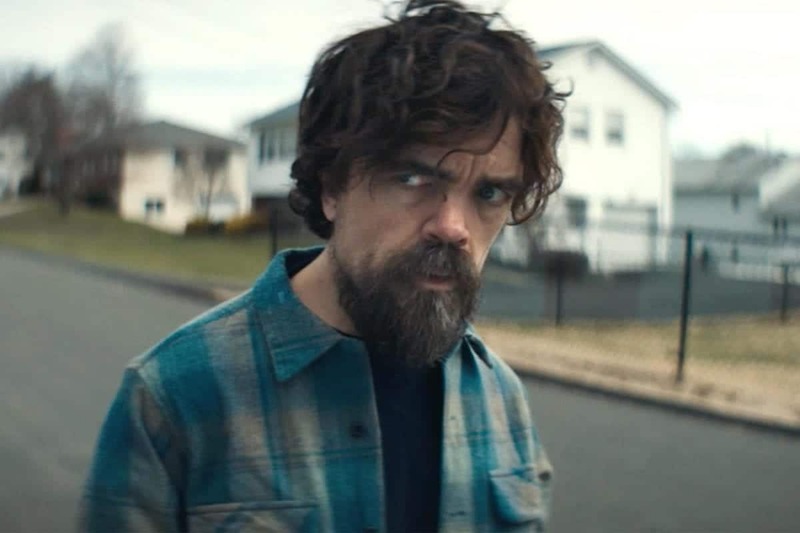 For the most part, this is a pure two hander between Peter Dinklage and Elle Fanning and what you get out of it will largely be dictated by whether you’re a fan of them as actors. The film is slowly paced and often light on incident, but that allows the actors the space to invest in their characters and to allow us to do the same. I found myself fully engaged in them and in their exploration of their world.